“Good eating, Mr. President,” said the sign around the 1963 Thanksgiving turkey’s neck. “We’ll let this one live,” John F. Kennedy said, in essence pardoning the turkey. The turkey lived, but Kennedy himself did not. He was assassinated four days later, six days before Thanksgiving. Where did the tradition of pardoning a Thanksgiving turkey come from? From Abe Lincoln? The Lincolns lost their second son, Edward, when he was not quite four. It was a devastating blow to Lincoln, then a country lawyer, and his wife Mary. By the time he was elected president, Lincoln had three living sons. When he took office, early in 1860, South Carolina had already seceded from the Union. It would be a hard four years in the White House. Robert was away at school in New England. Willie and Tad (short for “Tadpole,” his father’s nickname for Thomas) lived in the White House during the Civil War years. As he brought the nation through the horrors of the Civil War, Abraham Lincoln suffered terribly for the lives that were lost, North and South, on the bloody battlefields, because he knew the pain of losing a son only too well. Abe and Mary gave their two boys, Tad, 14, and Willie, 10, the run of the White House, which raised a lot of eyebrows in silent disapproval. Tad and Willie even built a fort on the White House roof. Tad, with his lisp, was the boisterous practical joker. Willie was the shy scholar. 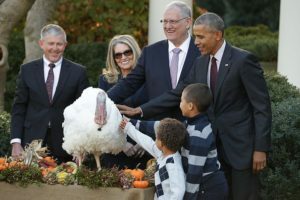 One Thanksgiving, when a live turkey was delivered to the White House, to be served as the holiday dinner, Tad named him Jack and begged that Jack be spared. Told that this was an impossible request, Tad was beside himself. He ran to his father and burst into a war cabinet meeting, sobbing, “He’s a good turkey!” Tad obtained the necessary Presidential pardon for Jack just before the axe fell. Thus began the tradition. 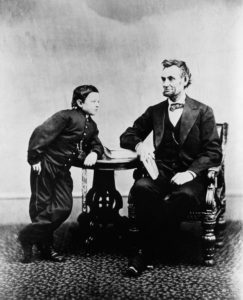 The Lincolns dealt what Abe called another “staggering blow.” Willie celebrated his 11th birthday just before Christmas 1861, but he and Tad fell ill just after Christmas, probably with typhoid fever. Tad got better. Willie held on until late in the afternoon of Feb 20, 1862. Said his grieving father, “He was too good for this world… it is hard, hard to have him die.” Lincoln was reelected, the war ended on Apr. 9, 1865 and Lincoln was assassinated on April 15. Great story! 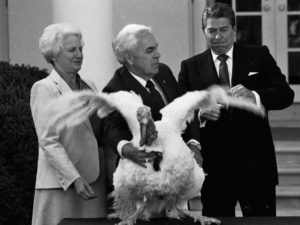 It looks like Ronald Reagan was not quite so adept at dealing with turkeys.